It might surprise you to learn I’m not one to have a “signature” dish. 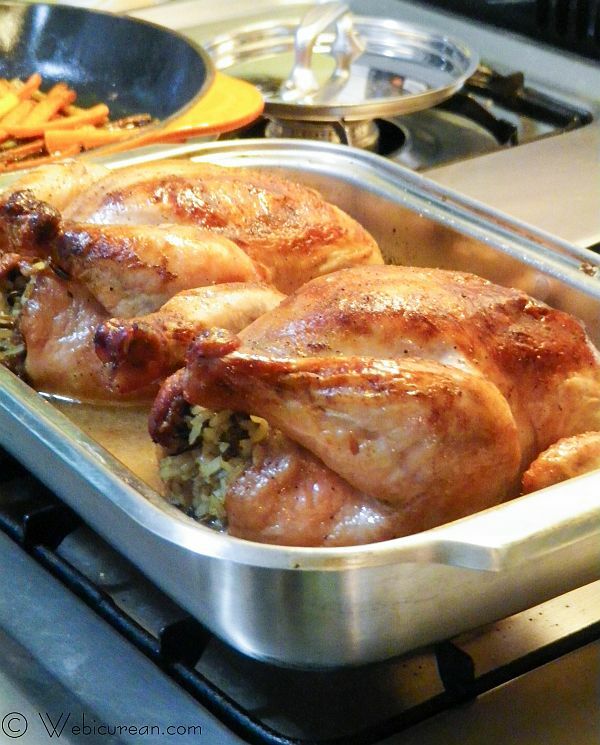 Sure, I have my favorites, and certainly I have a number of specialties, but nothing you could call “Anne on a plate.” At one time, though, these stuffed Cornish game hens might have fit that bill. This is a dish my mother would make for special occasions, and I continued that tradition for some time. What could be better than being served your own little bird packed with a savory wild rice mixture? Not much. For whatever reason, though, I haven’t made them in several years. Poor Morgan, he never knew what he was missing. So, when I saw my local butcher had fresh, organic game hens, I snapped them up. If you’ve never tried a Cornish game hen, you’re in for a treat. Cornish games hens were first introduced in the mid-1950s when AlphonsineÂ and Jacques Makowsky got the idea to cross-breed Cornish game chickens with other birds including the White Plymouth Rock Hen. About a decade later, Tyson started producing them on a larger scale, bringing them into the mainstream. Nowadays, they’re readily available in your grocer’s freezer section, unless you find fresh ones like I did. With Valentine’s day around the corner, I figured this would be the perfect dinner. Morgan was certainly impressed (and pleased to have a whole bird to himself). For the most part, Cornish game hens run under two pounds each. These fresh ones, however, were over two pounds, so they took a little longer to cook. Also, I split them in half, as a whole one was just too much food for one person, and the leftover meat was used in a tossed salad the next day. You’ll note, I don’t baste these while cooking but rather flip them over to cook breast side down 1/3 of the cook time. This helps keep the breast meat from drying out, and works much better than basting. The end result was moist and tender all over. That’s what you want. 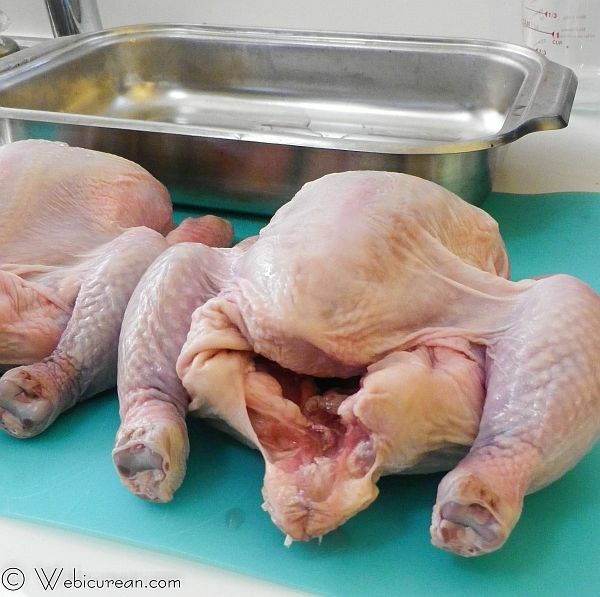 Try this technique the next time you roast a whole chicken (in liquid)–you’ll wonder why you haven’t been doing it all along. Wash and pat these guys dry. Sprinkle a little salt and pepper inside, then stuff with your favorite rice mixture. Truss the legs with cooking twine, then pour in the wine, sprinkle with salt and pepper, top with a pat of butter, and put ’em in the oven. About a third of the way through cooking, turn the birds upside-down, and let cook that way a third of the time, before turning right-side-up to cook for the remaining third. Let them rest a few minutes before serving. Figure one smaller bird per person; however, if they’re plump like these, split them down theÂ middle and serve half per person. 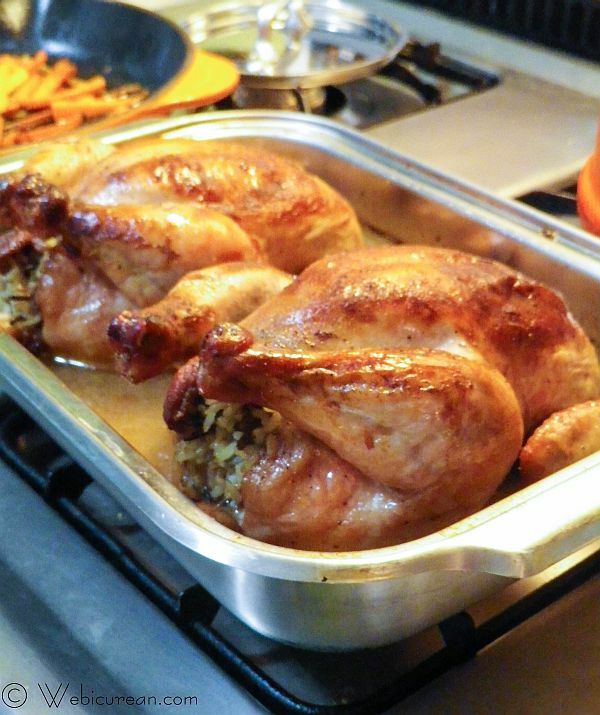 These moist and tender Cornish game hens are stuffed with a savory wild rice mixture then roasted in white wine, perfect for a special occasion. Wash and dry the game hens. Place in roasting pan, and pour the wine over them. Sprinkle with salt and pepper, and place a pat of butter on top of each bird. 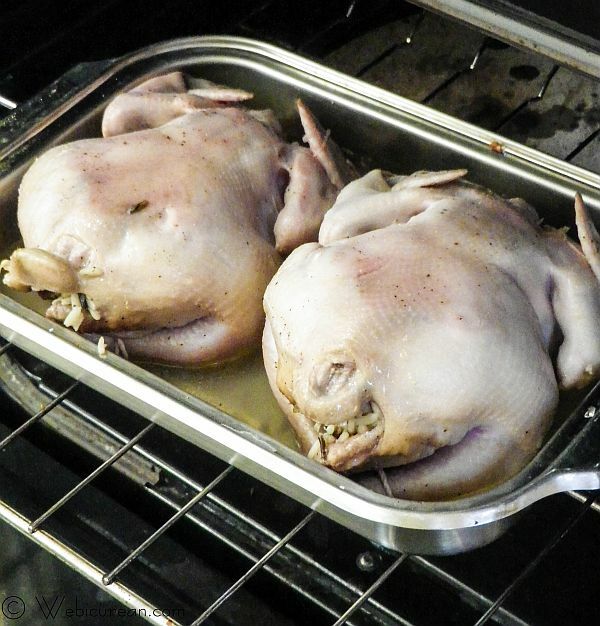 Depending on the size of the birds, these will need about an hour and 15 minutes to cook. For best results, cook in the oven about 25 minutes breast side up. Turn them over and cook breast side down for 25 minutes, then return to breast side up to cook for the remaining 25 minutes. These fresh hens I bought were just over 2 lbs each. The smaller birds in the freezer section will likely need less cook time, maybe about an hour instead. 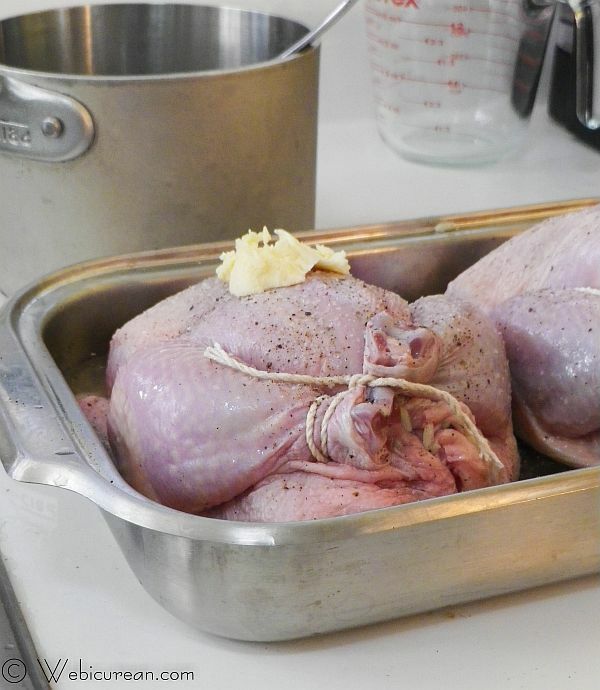 Allow to rest a few minutes then remove the twine before serving. Serve one hen per person. *Note: In a pinch, you can also prepare a box of long grain and wild rice to stuff the birds, which is what I did here. I made this recipe today. 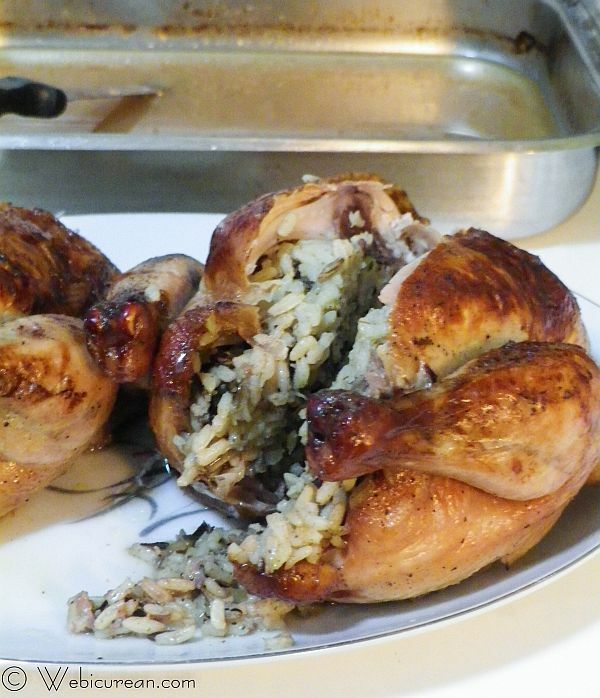 I used just one cornish game hen, stuffed with wild rice and mushroom mixed stuffing, and followed your recipe verbatim. It came out so juice, so tasty, and the skin was nice and brown. Wonderful recipe! Thank you so much. Hi Diana–so glad you enjoyed it! 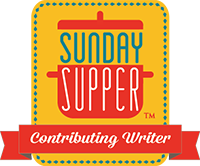 It’s one of my favorite recipes at home–my mom used to make this for special occasions, and it’s a tradition I love to continue, even if it’s just a regular old Sunday supper! Is the rice already cooked when you stuff it? Hi Robin–Yes, the rice mixture needs to be cooked first. Enjoy!